I can’t believe I forgot to post about this one but I suppose with all of the tastings at The Four Firkins that week including the visit by La Trappe”s own Father Isaac and the subsequent visits to Grumpy’s NE later that evening and then The Muddy Pig on their 7th Anniversary the next day. For those that don’t know La Trappe is the monastery located in the Netherlands that produces the Koningshoeven line of Trappist beers, and the only brewery in the country to bare the Trappist name. Though I was lucky enough to have the opportunity to sample and thoroughly enjoy a bit of Koningshoeven’s 125th Anniversary beer Isadâ€™or at The Firkins, named for their first brewer who though a monk avidly enjoyed technology and learning how to work anything he could find; their Witte was only to be available later that night at Grumpy’s NE. Unfortunately I arived to late to sample any at Grympy’s but was informed there would be another keg the next day at The Muddy Pig. Luckily The Muddy Pig had plenty when I arrived and as an added bonus everything was 1/2 off due to the celebration. 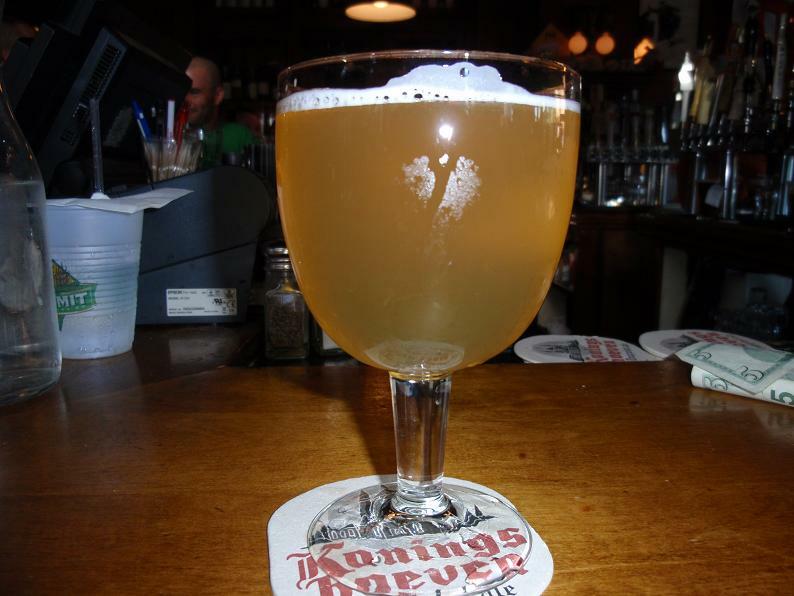 The Witte pours a pale yellow hue that is very translucent. Head was about a finger and pure white from the tap, though I’m sure you will be get a lot more from the bottle when they come around next year. Aroma is full of wheat with light fruit and herbal notes coming from the yeast which I found quite appealing. Flavor is very nice. Notes of banana, clove and other herbal flavors are rounded off by a nice wheat grain sweetness. Though this is obviously a Witbier it isn’t overly grainy but instead very nicely balanced and clean. With a 5.5% ABV this is one Trappist brew you can enjoy all evening long. Body is quite light and the mouthfeel is a bit carbonated but not over the top. This is one very nice brew that exemplifies the quality of the brews made by Koningshoeven over the past 125 years. Unfortunately this beer and Isid’or won’t be available until next year but when they come around I would suggest them highly. Even if wheat beers aren’t quite your thing this one might make you open your mind. Give it a shot and ride your bike.